Some Quinoa is pre-washed (like Organic Natures's Earthly Choice Premium Whole Grain Quinoa and Bob's Red Mill Organic Whole Gain Quinoa)). If it is not pre-washed you will need to rinse it first through a mesh strainer to remove the bitter saponins. Bring 2 cups water to a boil in a 2 qt sauce pan. Add 1 cup Quinoa, bring back to boil, cover, cook over medium heat for 12 minutes or until Quinoa has absorbed all the water. Remove from heat, fluff, cover and let stand for 15 minutes. 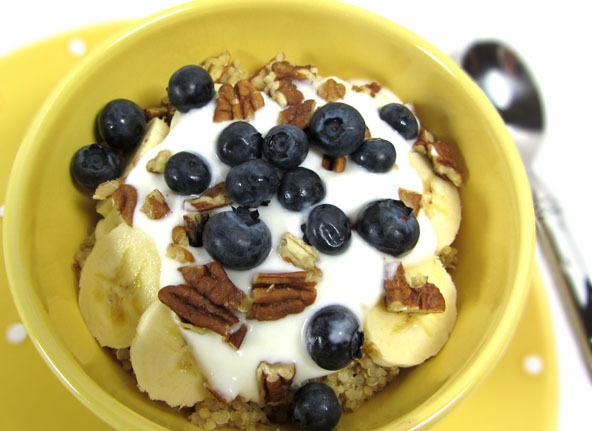 Place the cooked quinoa in individual bowls and add the nuts, fruits of choice and yogurt. Drizzle maple syrup or sweetener of choice on top with a sprinkle of cinnamon. You can pour Banana Nut Milk over the top if desired (optional). If you only need a single serving for breakfast, save the rest of the cooked quinoa in a sealed container in the refrigerator. Plan to use the quinoa in a salad or side dish for dinner or for breakfast again tomorrow. It’s always nice to cook once and use twice whenever you can.